The Mosin Nagant is truly a manly piece of hardware. Let’s discuss why. 1: First, the Poison Maggot is a time proven design. Dating from 1891, all the bugs have been worked out. This assumes there were any bugs in the first place, which there were not. No one would dare to be less than optimal for the Tsars and Commissars. 3: Versatility. One can argue the benefits of the spear versus the club. Guess what? The Russian Gun-Club is both! And it shoots bullets! Why compromise when you can have all three? 4: Physical fitness. The Rosined Nag is heavy. No real man would complain about this. In fact, he boasts of it. One has to be fit to carry it, and fit to aim it without shaking like a coward. Not to worry. The recoil will reseat that loose shoulder and save you the medical bills. 5: Economical. The Soviet Man Cannon is dirt cheap–$100-$200 in 2009 prices. You can typically buy 10 to 20 of them for the price of a modern rifle, and the ammo is about half the price, and has been in production for more than a century. One sacrifices rate of fire and accuracy, but that’s offset by the fact that an entire platoon of your friends now have guns. Besides, your friends are men, so every shot counts, right? Who needs rate of fire. And any real man can hit through force of testosterone, without bothering with sights. Just imagine your enemy is a toilet, unzip and pull the trigger… so to speak. Flush him straight into a grave or outhouse. Or both. 6: General manliness. The Tula Jackhammer has no prissy “Ergonomics” or “delicate triggers” or other crap. It is a brutally simple tool. If you can’t pull the trigger, then do some more grip exercises, you pansy. Don’t like the recoil? Get a recoil pad, chew a handful of Vicodin, and see your doctor for some testosterone shots. The length of pull is too short? Wear a stout Russian overcoat and stop whining. And some earplugs, since you probably don’t want to hear the rest of the “Commie Chiropractor” community laughing at you. 7: History. You may wind up with a Russian or a Finn rifle built on a Russian or French receiver, a Czech, Chinese, Polish, Hungarian or even one of the rare American made models, from the Russo Japanese War, WWI, the Russian Civil War, the Spanish Civil War, WWII, the Winter War, the Continuation War, Korea, Vietnam, Afghanistan… the “Baltic Flamethrower” has traveled the world. Be sure to check the date on the tang under the stock—it may be an antique made before 1899, which means it’s a rifle, but not legally a firearm in most English speaking nations. This just makes politicians go into a tizzy. You may hear complaints that as a non-American weapon, or worse, the weapon of our former enemies, no American should own one. But that’s just a misunderstanding of the situation. The fact is, Ronald Reagan, one of our manliest presidents (after such other greats as Teddy Roosevelt), stomped the Soviet Empire into the dust with the tool of capitalism, and we are now selling that empire off on the internet for ten cents on the dollar. A Musty Nugget is not only a manly weapon, it’s a political statement. If you can only afford one rifle, this is the one to have. If you can afford several, this should be one of them. Men, raise a glass of vodka to Sergei Mosin and Leon Nagant, men for their time, and ours! It pleases me to see you’ve included a Ryazan Wristbreaker (Obrez). A good choice for singeing eyebrows and perforating eardrums. If you don’t kill your enemy you will certainly incinerate them…please wear your shades! Despite having fired a variety of M/Ns, I can’t imagine what it would be like to fire one of those things! Those guns look so badass. I would love the opportunity to try several of those out and really get a feel for them. 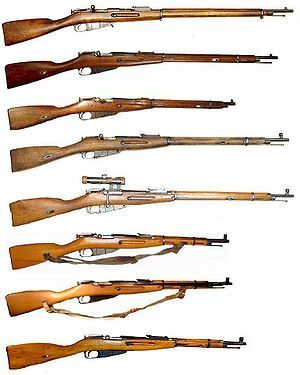 Mosin/Nagants are still probably one of the cheapest high-power rifles you can get. Usually between $100-150 in most sporting goods stores that carry vintage rifles. I don’t know where you are located, but a good place to check out various time periods in living history is Military Through the Ages in Jamestown Va in a couple of weeks. Check out the Jamestown Plantation site. If you want to reenact, whatever the impression, do extensive research before you buy anything. If you are considering joining a particular group, talk to them first about authenticity requirements. Hope that helps!